How are Sisu Beads made? Memorial Jewelry is oh so special. We will cherish and honor your loved one while we make their memorial. We strive to make the ordering process as easy as possible. 1. Place your order on the website or feel free to call us and place it over the phone. 2. We will mail you an ash collection kit with instructions. You will use the included spoon and place a small amount of ash in the provided container. We need only a small amount of ash (about the size of a watermelon seed) for each bead. Mail the ash to us via US mail in the provided postage paid envelope. We believe we are creating more than jewelry. The spirit is cherished throughout the process. Please feel free to send us a photo and tell us something about your loved one. 3. Your bead will be hand sculpted. The ash will be hand mixed with the glaze and fired into the bead. Each bead is made separately in a clean environment. You have no need to worry about the ashes being mixed. Any ash not used will be returned to you. 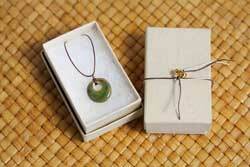 The artist will create your jewelry with the finished bead. 4. You will receive your order via USPS Priority Mail in approximately 3-4 weeks from when we receive the ashes. Please contact us if you require your order sooner than 4 weeks. Expedited service is available.